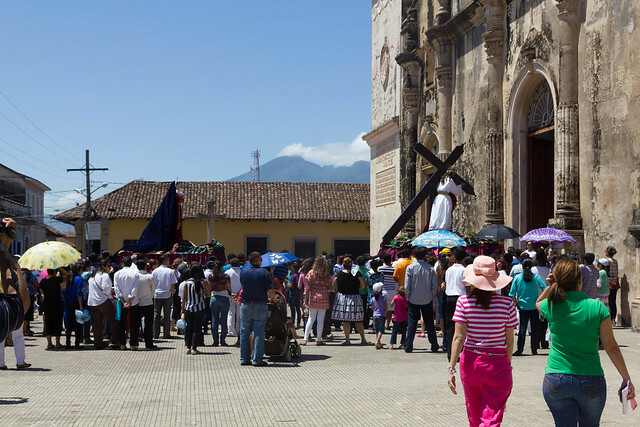 Central America is deeply catholic. 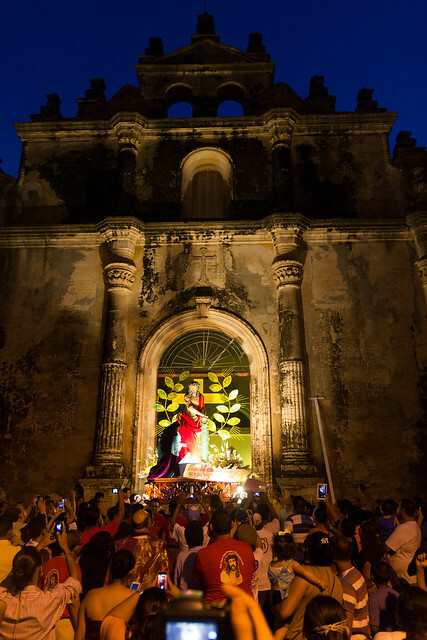 This results in the week leading up to easter (Holy week – Semana Santa) being the big event and travel week, where everything closes except for the churches that ramp up their efforts to new levels. As far as foreign travelers are concerned this week is dreaded because finding a hostel can suddenly become an issue and prices rise to new levels. 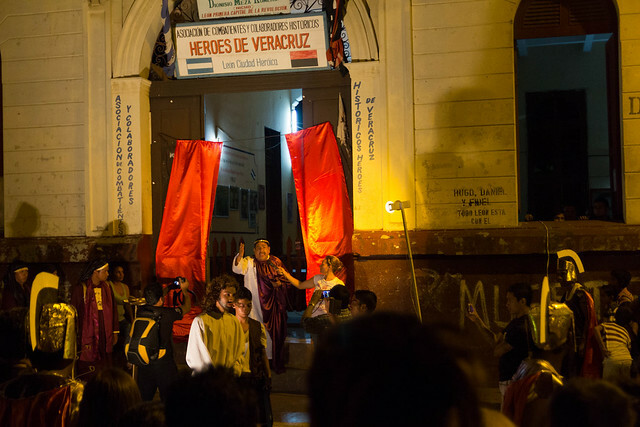 Central Americans as well as foreigners tied to school holidays suddenly flood the hostels. Public transport is virtually shut down on Good Friday (and Easter Sunday?) further contributing to the the joys of traveling. The churches use the lock-down to sell their story. 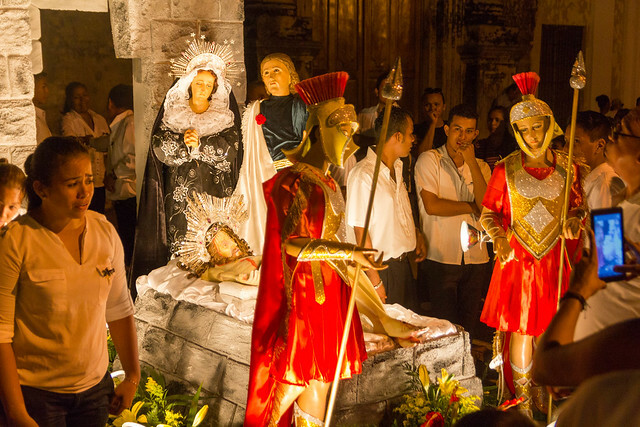 In Granada, I witnessed three processions. On Thursday evening the procession probably was pretty much the same as every other one (they happen pretty regularly), except for a higher-than-usual attendance. 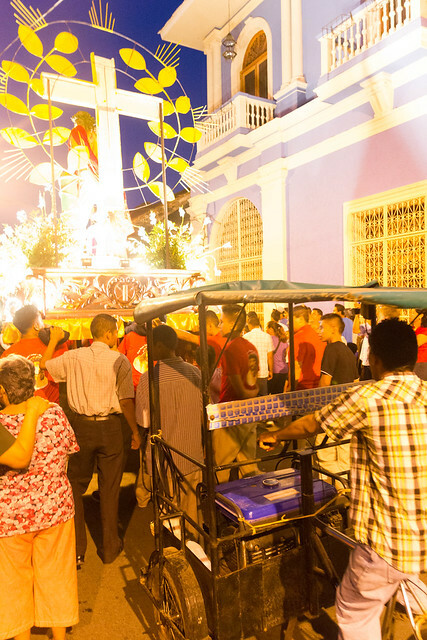 Statues of Jesus are carried through town. 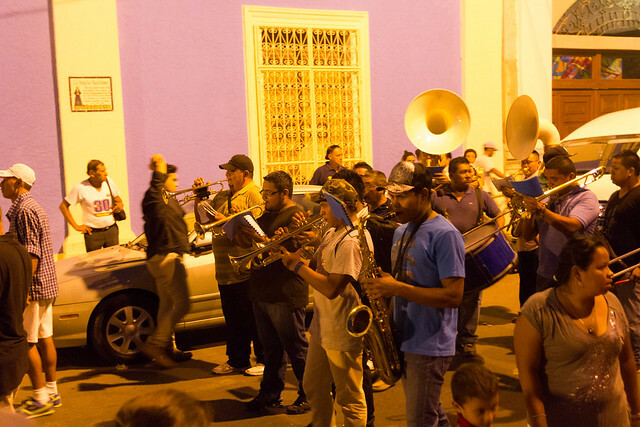 In the dark, they are followed by a bike-mounted generator and a brass band playing – well – mostly loud. Jesus leaving the church for the Thursday evening stroll. Click here for a video. While I was having breakfast on Friday at 8 AM, Jesus left for another tour of the city. This time carrying his cross and followed by Mary. Some people in my dorm did not fully appreciate the brass band passing directly below the open window. Others didn’t even notice. Jesus and Mary returning from the morning stroll through town. 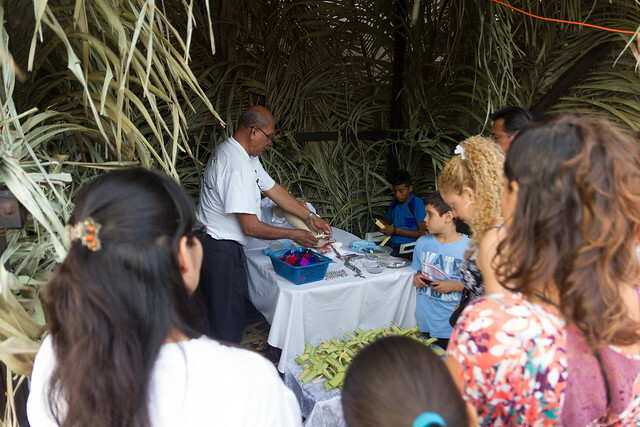 During the day, vendors were cashing in on the celebrity status and selling all kinds of Jesus figurines, crosses and other memorabilia in front of the churches. On Friday evening, Jesus was dead. This celebrity death attracted loads of photographers, both local and international, and gave rise to another procession through town. With Jesus dead and Saturday not being a holiday, I decided to use my window of opportunity and get on collectivos that brought me from Granada to Leon. Here I basically had to kill time before ascending Telica Volcano with Quetzal Trekkers in the night. More on that trip later. 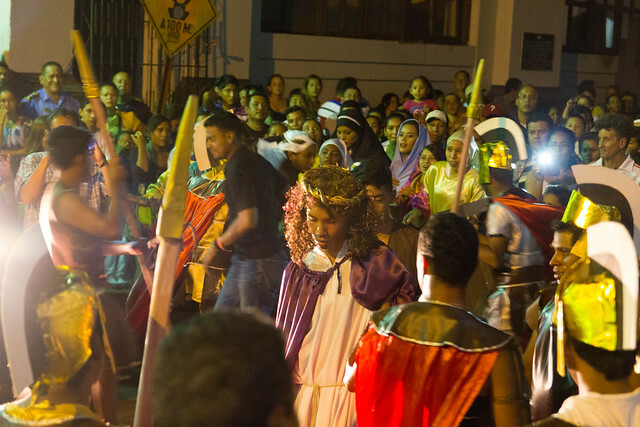 While the city was pretty empty during the day – no sane person moves more than necessary at 35C+, there were more Jeusus processions during Sunset. 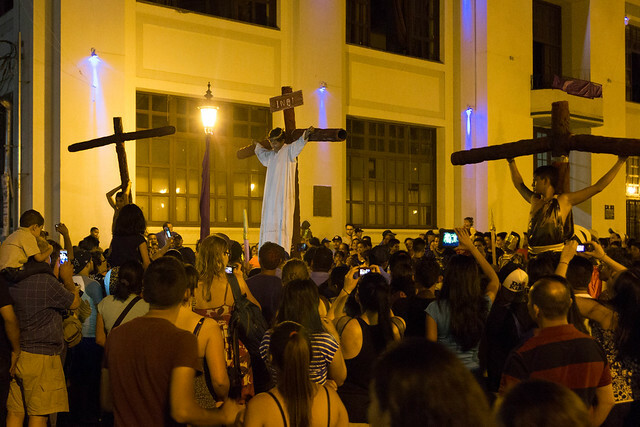 Later in the evening I got to witness Jesus being dragged through the streets, quick-trialed and finally crucified in view of the cathedral. The crucification proved a bit difficult with one guy not really fitting his cross (I think it was swapped with the one of Jesus), and Jesus’ hair falling off a couple times. 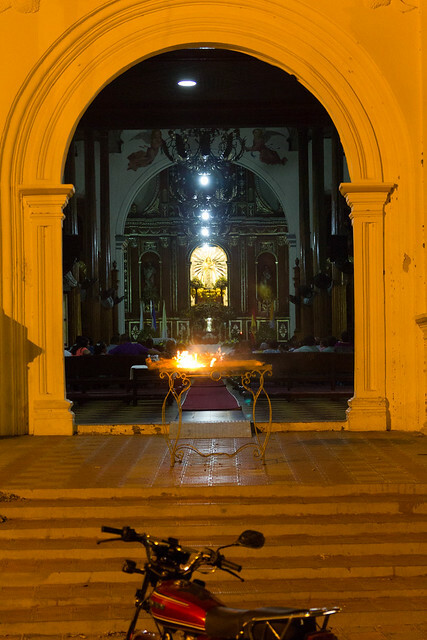 Later there were easter fires in front of the church, followed by easter fireworks after the service. Leon has one cool celebration that I sadly missed. People fill a whole street with colorful pictures made from dyed sawdust. View all posts by ¡Flo!